The Indigenous People of Biafra, IPOB, on Thursday described as unfortunate a media publication (not SML Media), which tagged former Vice President, Dr. Alex Ekwueme and a former Commonwealth Secretary General, Chief Emeka Anyaoku as “IPOB commanders”. 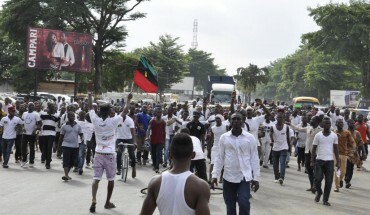 The pro-Biafra group in a statement by its spokesmen, Barr. Emma Mmezu and Dr. Clifford Iroanya, said whereas it simply identified the duo of Ekwueme and Anyaoku as among credible Igbo leaders who could lead its negotiation, a particular media publication deliberately twisted its statement and described the elder statesmen as IPOB commanders. The statement reads in part: “it has come to our notice that agents of our oppressors and avowed enemies of peace and justice has deliberately and mischievously twisted our suggestion that the visiting US Congress delegation meet with Anyaoku, Ekwueme, Nwabueze and others, to mean that these great gentlemen has suddenly become IPOB members. “This is not so, hence this clarification. “Three weeks ago, the US Consular General visited the Southeast on fact finding mission. Surprisingly, he met only with the APC executive in Enugu and predatory elements of moribund Ohanaeze, where road construction, second Niger Bridge, appointment of more Ndigbo into Buhari’s cabinet etc, were presented to the US delegation as the reason for our agitation for freedom. “Again, two days ago, a delegation of US congressional staff arrived from Washington D.C. led by a senior staff of US Embassy in Nigeria and met with Ohanaeze at Nike Lake Hotel, Enugu, over our agitation for freedom from the hostile prison called Nigeria. “Well meaning and conscientious people all over the world expressed outrage and shock, wondering why in the world are these US delegation desperately avoiding the most credible names from our political space. “The world over, fact finding teams usually seek out the most credible names in their search for the truth, not organisations that are well known to all and sundry as political jobbers and government errand boys, like Ohanaeze, whose sole agenda today is only how to establish a self serving relationship with the present government as they always do and have done with previous governments. “IPOB maintains our position, that these visiting delegation ought to endeavour to meet and speak with credible names like Anyaoku, Nwabueze, Ekwueme, and co.
“That does not in any way translate to any of them suddenly becoming IPOB commander, like one mischievous newspaper terrifying Anyaoku in private unsolicited emails yesterday. “Convinced that over 90% of our people are standing with IPOB today, we dare the Nigerian government to organise a referendum to ascertain the authenticity of our demand for freedom. “Our assertion that these and future visiting foreign delegation endeavour to meet with Ekwueme, Anyaoku and co, did not make them IPOB commanders. We also would wish them to meet with other credible opinion leaders from the clergy, traditional rulers, town union leaders, and even student unions. “Discreetly arranging them to meet with Ohanaeze and scurry away the next day is suspicious, more importantly, hiding their visit from IPOB, whose agitation led to their visit in the first place is dubious. “This clarification became necessary because we learnt from these great men that some journalists are sending them emails asking them ‘Sir, is it true that you were appointed IPOB commander’?